Happy 1st Birthday, Buffy! Laura and Matt celebrated with a puppy pool party at the Barkle y followed by dinner with friends at the Lazy Dog Cafe. Buffy didn’t need the “puppy preserver” for long- she loved swimming! When Matt and Laura, a darling couple and both movie stars, visited to pick up Buffy, my family was amazed by Matt’s vocal performance of “Dancing Through Life” accompanied on the piano by our son, Sam. It was fabulous!! We are absolutely delighted with Sophie! She is very smart and energetic and appears to be completely house broken (she goes out on our decks with minimal prodding). We assume she must have learned a bunch at your house. And Max and her are best friends already. She is getting acclimated to all of us and her new home. She and Teddy have been racing through the house. We forgot what it was like to have a puppy and are trying to hide all the cords… We were able to get her an appointment with her vet today. Her doctor (who has had several female Bichons) said she is in very good physical health and is a wonderful Bichon Frise. Just know you are bringing a lot of good energy into the world. Just wanted to thank you for giving me such a wonderful puppy. Coco Bella is doing great. I never thought I could love another dog as much as I have Dasha. She is so loving and spunky. Just wanted to share with you the most recent photo of Sam and Ace. They are both in good health. They recovered from their neutering without complications! They are super active! There is not a day that they do not wrestle! They are so entertaining and very affectionate. We usually buy toys, two of each, so they both have the same, but they always end up fighting over one. So hilarious! 🙂 Love them both! Have a great summer! Just wanted to let you know that Beauregard is doing great. He is such a funloving little guy and has won our hearts. Potty training is going great as well- only one accident in the house on Day 2- I was not watching and missed his signals. He sleeps 8 hours in his crate at night with no whimpering- amazing!! Thank you again for all you and your family did to make Beau such a delightful dog. Just wanted to send you a quick update on our awesome puppy, Winnie. Winnie is a great puppy with a happy demeanor and fantastic personality! We all love her so much!! She makes us laugh every day! We want to thank you again for letting our family adopt her into our own. All the best to you and your family! Here is a recent picture of our daughter, Kosette, and Winnie smiling big for the camera! Have a good summer. The puppies are wonderful and already half paper trained! However, they are not interested in our much colder climate:). And the older kids are through the roof. Thanks for making this an amazing Christmas. They just are so good with the kids!! Thanks for the heads up about Anna, but Elsa is the trouble maker! They are both adorable. We already adore them. They are so loved:). Merry Christmas!! We brought Posie home 4 days before Christmas. She is too small to push the pet door open, but she goes to the back door and a little “please” and she makes a bee line to the ” k-9″ grss! She is SO smart. She reflects the wonderful Hales family, their softness in personality and gentleness in manner. I have a strong feeling Posie will have a sister before long! I found them on line and knew it was the right family for us the first time I talked to Adrienne! Charley has been here for almost a month now and I can’t begin to tell you how much joy she has brought to my life! She’s the best companion ever and very smart. She is learning fast. Her latest challenge is learning to greet people and other dogs calmly because she loves everyone (especially kids)! In just a week, with lots of practice, she has made great strides. She is still happy to see everyone but can keep all 4 on the floor! She is potty trained and is walking nicely on a leash. She loves the beach, playing with her toys, and just hanging out with me. She’s been so good that on days when I don’t have a lot of meetings out of my office, she comes to work and everyone enjoys her. When she needs to stay home, she was quickly crate trained and is quietly napping when I arrive home. Watching her little tail wag and getting kisses as I let her out, is always a welcome sight! Thanks so much for giving her such a great start with you and your family. I’ve attached some of our first photos. She keeps me busy enough, I don’t get a lot of photos! Thank you again. It’s Denise, Diane’s friend. Just wanted to tell you how over the moon Diane is with Charley. She looks adorable. Thank you for being an awesome breeder and person. I’m so happy for Diane and glad I got to meet you. Keep making families happy! Update: It’s been awhile but have to tell you with a pleasure and totally enjoyment we have had with this puppy. She is so special to us and spoiled rotten. She is turning into quite the facebook queen!! whenever I post a picture of her we get 50 hits. Sicily has Mike wrapped around her paws. Even though she was meant for me she’s definitely a daddy’s girl. Thank You Adrienne for this beautiful adorable puppy. 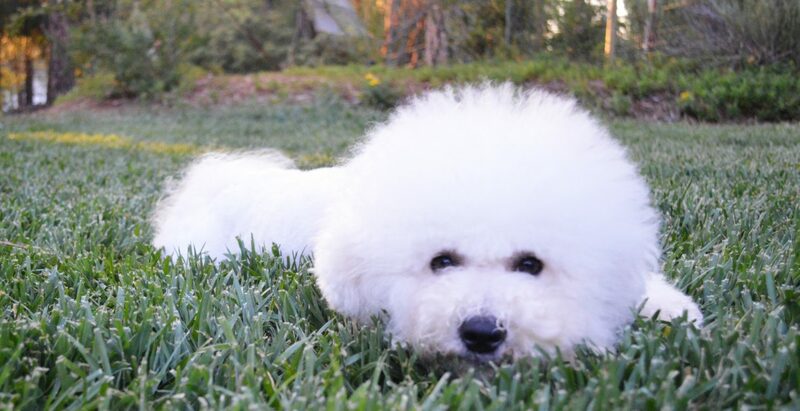 We found Adrienne online when I was looking for a bichon frise. Our bichon is amazing and his good breeding grows more and more obvious everyday. He’s highly intelligence, easy to train and has a perfect white coat. Adrienne always kept us updated and sent us photos of our puppy as he grew up! Blanco has been great. He’s been sleeping with us, we get up twice at night to take him out. No accidents in the house. He’s been playing well with the kids. Happy pup. We’ve never seen a dog adjust so quickly after leaving their mom. Knows where his food is, knows to go to the door, we open it and he runs to the grass and runs back. He’s loving our backyard and playing outside with the kids. Great dog. Pippa is doing great, she is a wonderful animal. Maggie treats her like a baby. She takes Pippa everywhere. To watch the two of them interact together is entertaining to say the least. Pippa is extremely intelligent for a dog. It’s like she and Maggie talk and understand each other. Pippa literally yaps, and it’s very specific what she wants. When we were guardians of the golden retriever I mentioned to you, we achieved the same level of communication, but that took years. Pippa gets it very fast. She was house broken within a very short period of time, and I had read that Bichons can be a challenge. She has an accident now and then, but primarily because Maggie and I don’t catch her signals. 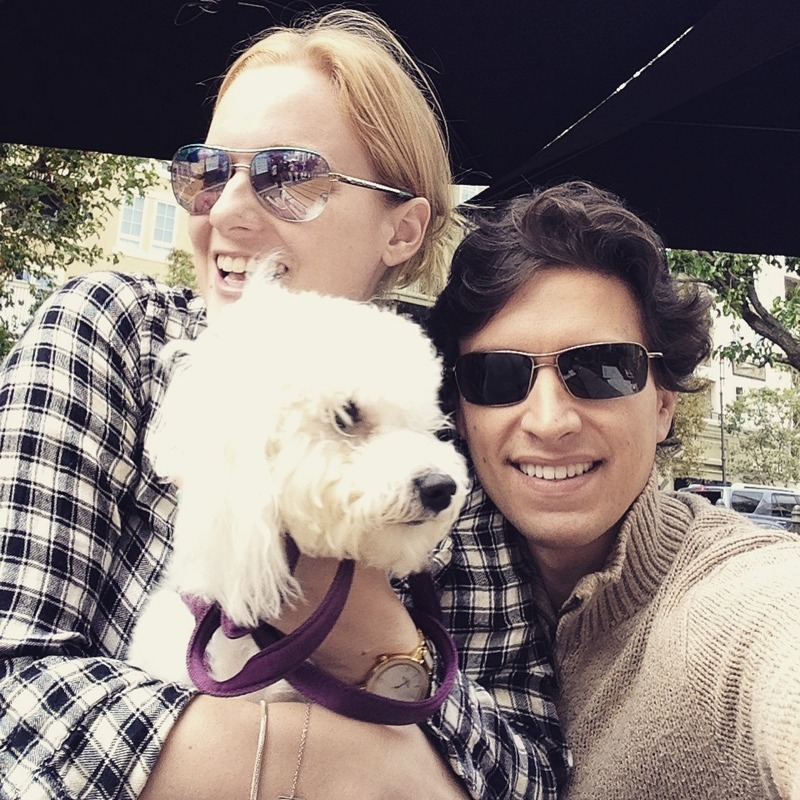 We are extremely happy to have found you as a responsible and caring Bichon breeder, and Pippa as a wonderful companion. You have a beautiful family and a warm home. Maggie and I enjoyed very much our visit with you all. I always smile when I think of you and your family. Your kids are wonderful. I’m writing to give you an update on my little boy pup, Brucewayne. I am officially in love with him. He is a delight. I often wonder if all Bichons are like this, and how Brucewayne is unique. He is full of personality and very smart. I love him so much — and so does everyone who meets him. I hired a private trainer, Sabrina. She is wonderful and amazing and has become a personal friend. I also board Brucewayne with her and her four dogs for several hours on days when I have to see clients all day. Brucewayne has learned so much from her. I just practice repeating all the commands and corrections when I am with him, and he gets them. He definitely knows the word “potty” and will do so on command. He is learning to touch a bell on the backdoor to indicate when he has to go. Brady is growing every day! We are enjoying him very much! He is a very active puppy who loves to play fetch! He will get third shot next week and then we can go outside with him – that will help the energy level perhaps! Plus I am going to sign him up for puppy school – think he will like that! We were thrilled to find you online and even more impressed when we met you and your children, as well as all the dogs! 🙂 These little Bichons are very lucky to come into the world with so much love and attention from you all! Keep in touch! Karli is doing great, the attached photo is her and Greta playing tug-a-war! She is eating well, whining when she has to go out to go potty. She also slept all night in her kennel, we put her right next to Greta’s kennel in our bedroom so I think it made her feel secure. Thanks so much for our wonderful puppy! Later: Karli is fantastic, she and Greta are inseparable! She’s so loving and such a happy little dog. No problems in house breaking either! I would recommend you to anyone looking for a Bichon! Roxi is doing awesome! She has only had a couple accidents in the house. Last Thursday she started taking us to the back door when she had to go. Wow! She gets the puppy of the year award! She is really sweet and fun. We are all thoroughly enjoying her. Pierre is 7 months old now and is really a beautiful dog. I was really impressed with the way he was cared for prior to our bringing him home. He was well treated and cared for by all the members of your family and was obviously well loved by your children. He adjusted well to our family and to our other bichon. They get along famously. The good care and attention all of the puppies got was obvious. I wanted to give you a brief update on our new family member – Mitzi. Mitzi is now a little over 4 lbs and is doing very well. Needless to say, she is the center of the household! I’ve attached a picture of Mitzi racing through one of her favorite thoroughfares. Thank you again for your part in bringing this bundle of love to our family. P.S. We really like the extra shampoo and conditioner you provided in the care basket. Can you let me know the brand of both? Thanks much! Thank you. Cooper is a happy, healthy puppy. Bailey is over the top! She has won us over. She is so smart- she knew her name by the second day! She did great with housebreaking from the very start. My husband loves her energy and fiesty personality. Bailey loves to wrestle with him. When the weather cools off he wants to take her to work with him. It is obvious Bailey was socialized because she is so outgoing with people. We are having so much fun with her! We have been enjoying Mozzie all day. He has eaten and enjoyed his water. He has played and snuggled, explored and slept. He seems very well adjusted and even likes football – you would never know he has only been here a few hours. Thank you so much for all of your advice and care. We are just over the moon! Just wanted to give you another Thank You for our sweet Cooper! We have had so much fun with the little guy and you were so right he is very feisty and silly! Carol and I just wanted to thank you for your time and efforts in regards to purchasing little Leah. Your family made us feel very comfortable with the transaction. The courtesy you and your family displayed was very much appreciated. In regards to little Leah, Leah is doing just fine with her transition process. Carol and I are blessed to be able to acquire such a wonderful, cute, intelligent animal. We will send you and yours pictures .We wish nothing but the best for you and family. We will keep you in our thoughts and in our prayers. I hope you and your family are well. We have named our puppy Bon Bon. He was such a darling on his way home the day we picked him up– he slept the whole way. The vet said that he is very sweet. My family has really fallen in love with him. He is very well behaved. We feel that he is kind of lonely though. He sees his reflection and is almost convinced there is more than one dog. We would like you to keep us in mind for future litters. Thank you so much for our little guy…he is truly a gem. Truffles is adorable! Her face is so beautiful. She is the love of my life. She has filled my life and my heart- she is just what I wanted. My neighbors and their kids love her. She loves all people. She keeps me busy, although right now she is curled up asleep on my lap. She is already fully potty trained. I am so happy with her- she is my little baby! Thank you!